Posted on August 22, 2014 December 7, 2015 Author thomasthethinkengineCategories Uncategorized2 Comments on Innovation: the Concept that Couldn’t. 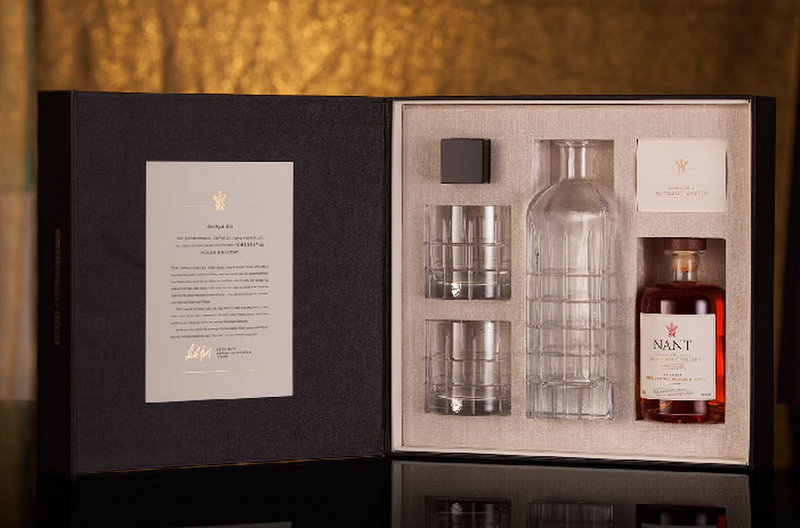 Posted on August 20, 2014 August 20, 2014 Author thomasthethinkengineCategories UncategorizedTags investment, nant, whisky8 Comments on A whisky investment needs a good whate of wheturn. Where in Australia should you buy a house? So could house prices actually rise from here? One economist whose blog I read has built a buy/sell indicator. It’s currently on buy. He reckons house prices will keep going up while the mortgage rate is not much more than the rental yield. He also theorises that Sydney prices rise first, and the rest of the country lifts thereafter. This theory holds water for me on an intuitive level. In the short run, a house in Melbourne is not a good subtitute for a house in Sydney, but in the medium term, perhaps it is. In the long-term, perhaps even a house in Adelaide could be a substitute! But house prices in Melbourne seem a bit high to be making bold acquisitions for speculative purposes. 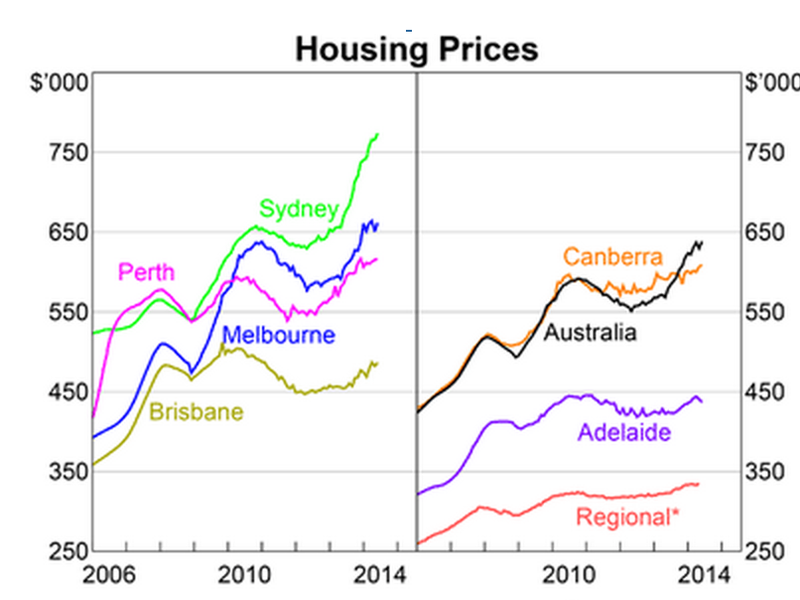 Luckily, house prices are very different across Australia. Sydney is way out in front. Perth, Melbourne and Canberra are a cluster. Then Brisbane and Adelaide are limping along at the back of the pack. Hobart doesn’t make the graph but it is somewhere back there too. If you wanted to buy a house somewhere cheap, which makes most sense? You’d want to choose a place with strong growth prospects. 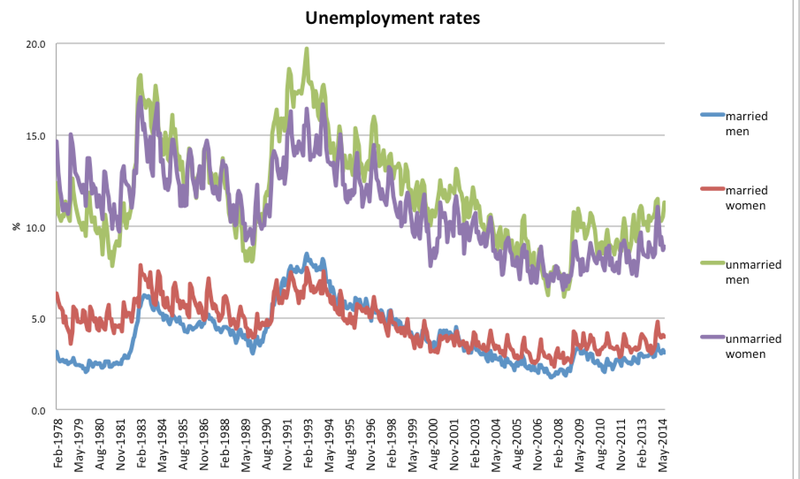 In recent times, all three laggards (Brisbane, Adelaide, Tassie) have shown a bit of pluck when it comes to the labour market (focus on the yellow lines). But you want to be careful. 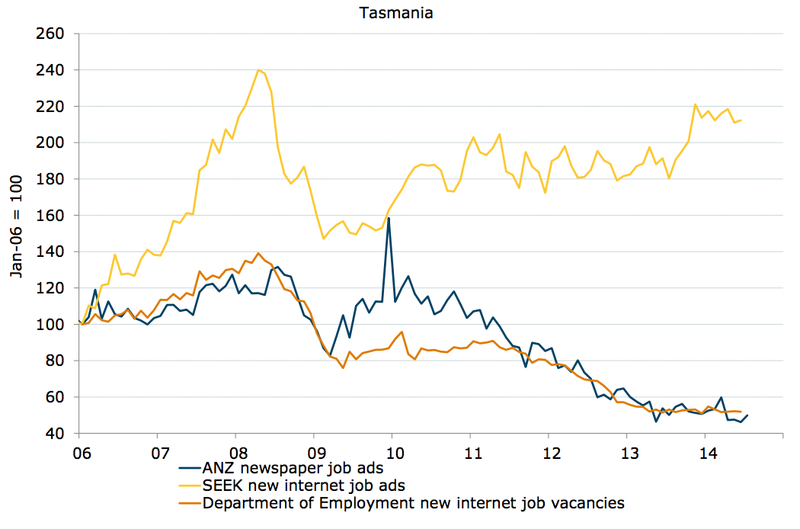 Tasmania’s prospects are pretty dire, as discussed in this piece: How long until Tasmania is totally empty? So which city are people most likely to move to? 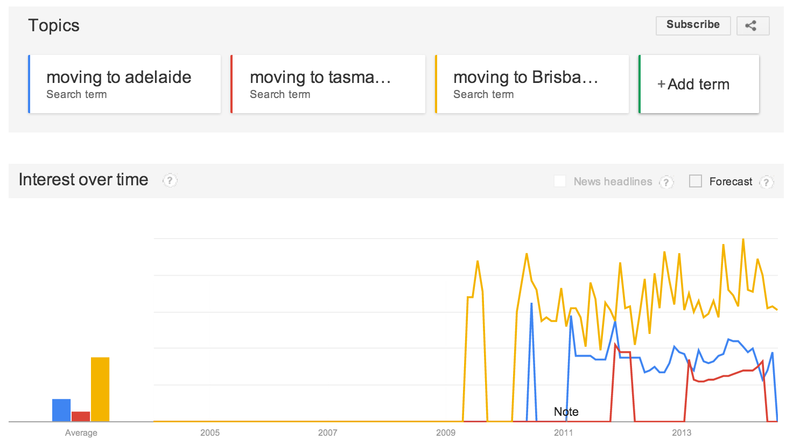 Google Trends says Go North! The Brisbane connection looks to be the smartest option. 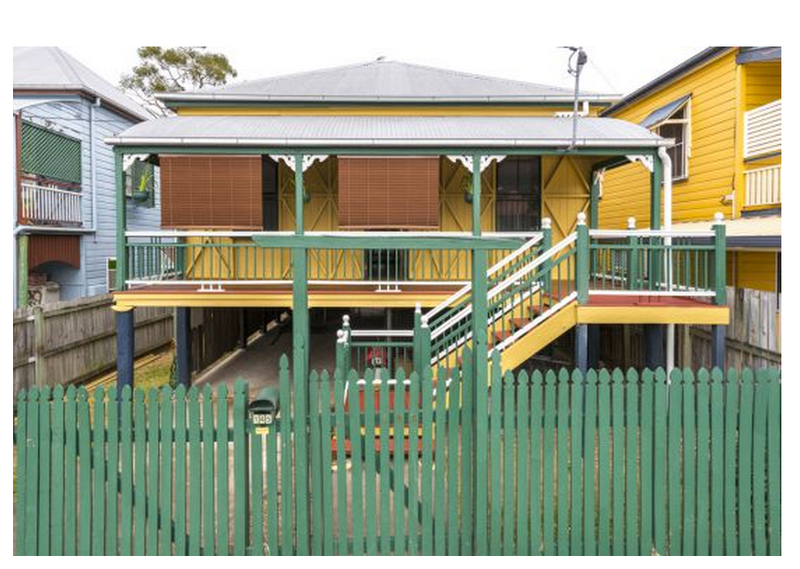 Hmm, how much is one of those famous Queenslanders (a wooden house on stilts)? Now, despite its “beautiful one day perfect the next” weather, Brisbane doesn’t rate a mention in the top ten cities ranked by the Economist for liveability. Melbourne scoops that award every year (Adelaide came 5th this year in results released today). But while we are being open-minded, it’s worth noting that that survey is horribly biased. If we broaden our horizons we find that Brisbane makes the top 25 list for the much hipper Monocle Magazine quality of life ranking, getting a shout out for its excellent Gallery of Modern Art. Is that enough to make you want to purchase your own place in the sun? Posted on August 19, 2014 August 19, 2014 Author thomasthethinkengineCategories UncategorizedTags brisbane, Economics, house prices, real estateLeave a comment on Where in Australia should you buy a house? To have and to hold (a job). 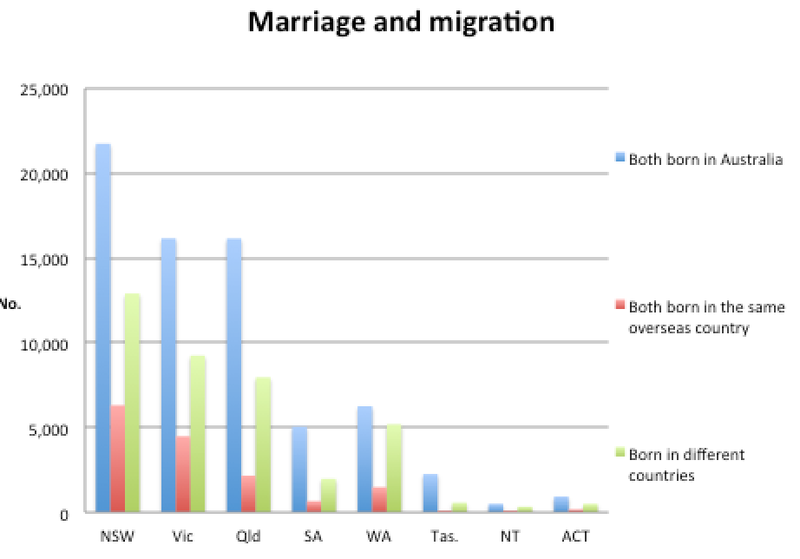 The correlation of marriage and employment is puzzlingly strong. You’d think getting married is relevant to your home life. You wouldn’t expect it to change your employment outcomes. I mean, I’ve never done it, but I doubt you get back from your honeymoon buzzing with a desire to read and reply to all those emails. 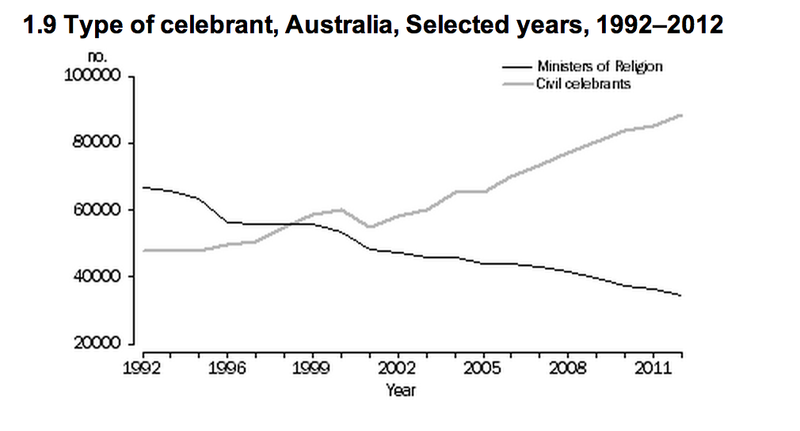 And yet, the correlation between marriage and labour market outcomes is quite astounding. The unemployment rate for unmarried men is nearly four times higher than for married men (11.3% vs 3.1 per cent). For women, the ratio is over two (8.9% vs 4%). The difference between married and unmarried makes the difference between men and women look small. Essentially, if you are a married man, you’re living in a labour market no different from the best parts of the 1970s, with 3 per cent unemployment! Might this be a statistical artefact? 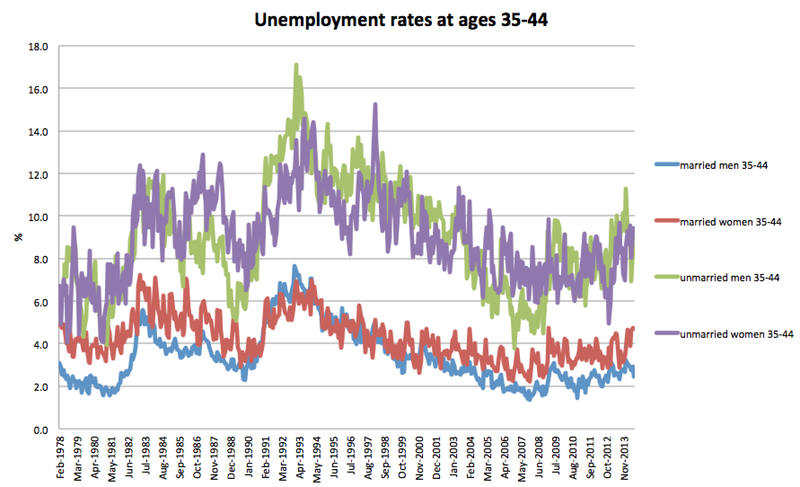 It could come about because the young have poor employment outcomes, and are less to be married. Let’s have a look at an older age bracket. The absolute levels of unemployment have fallen, especially for men. But the ratios of unemployment rates between married and unmarried are about the same: 4:1 for men and 2:1 for women. The above graphs make it look like married people are all hard at work in the office. But the unemployment rate hides a big difference in participation rates. There are two distinct clumps in this chart. Married men, who participate in the workforce at a rate of 95 per cent. And everyone else, who participate at around 75 per cent. The 80s were a time of rapid change for women. But since 1990, one of the biggest changes in the employment market has been unmarried men dropping out of the labour force. Their non-participation rate basically doubled from 10 per cent to 20 percent. Given the unemployment graphs on the previous page, I’d be very surprised if the red line (married women) didn’t tick up over the green line in coming years. 1. Why is the difference between the married and unmarried so strong, and so consistent over time? Perhaps the unemployed are busy proposing, but are rejected because they are unemployed? Perhaps there are confounding variables, like good looks or intelligence, which are correlated with both earning power and marriageability. Obviously marriage and children are correlated. Obviously children (who are cruelly forbidden by the law to earn the money to feed themselves) are expensive. 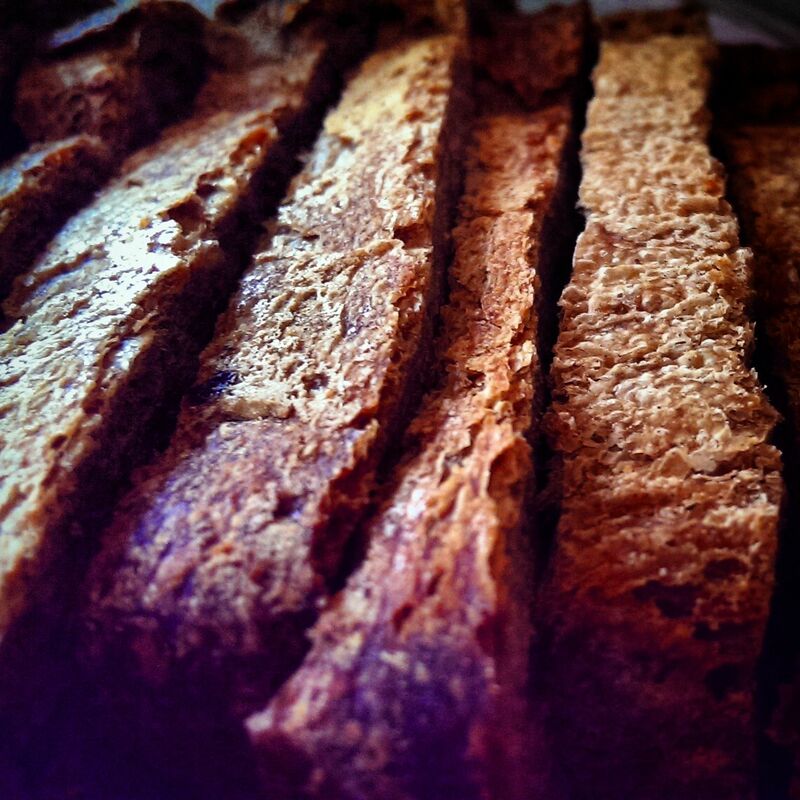 Could it simply be the compulsion to put bread on the table that explains why married people are so rarely out of work? 2. 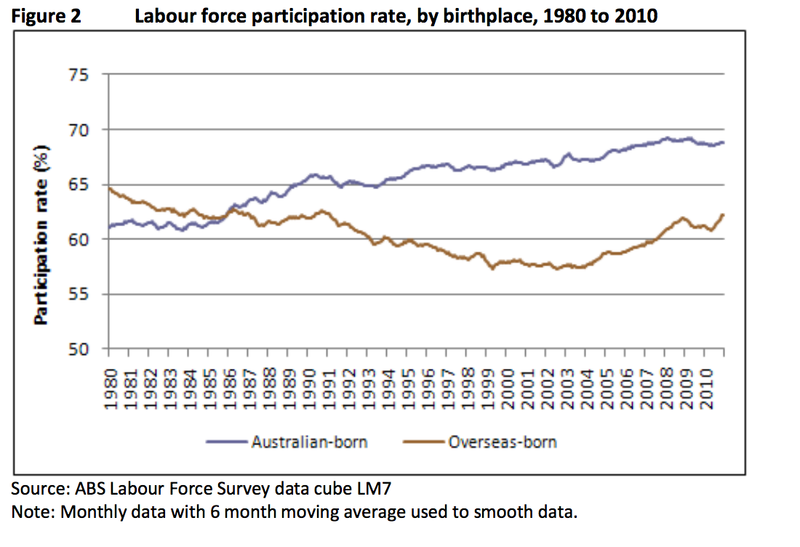 Why is the labour force participation rate of unmarried men eroding? 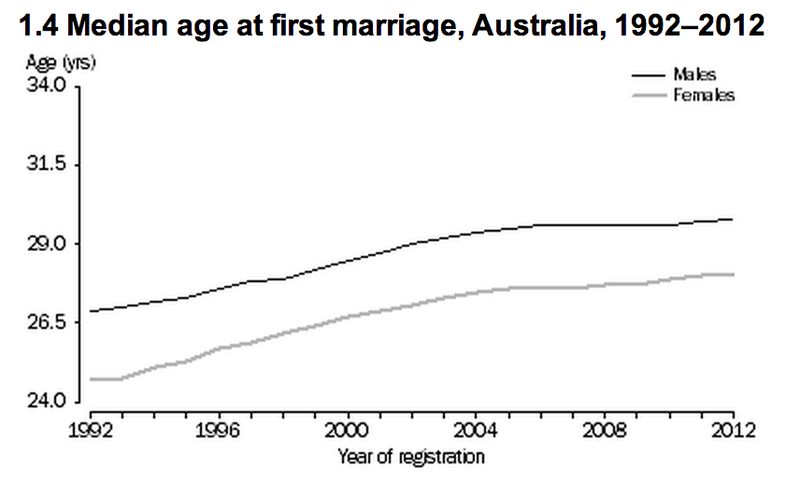 Marriage is increasingly rare, and increasingly for the old. 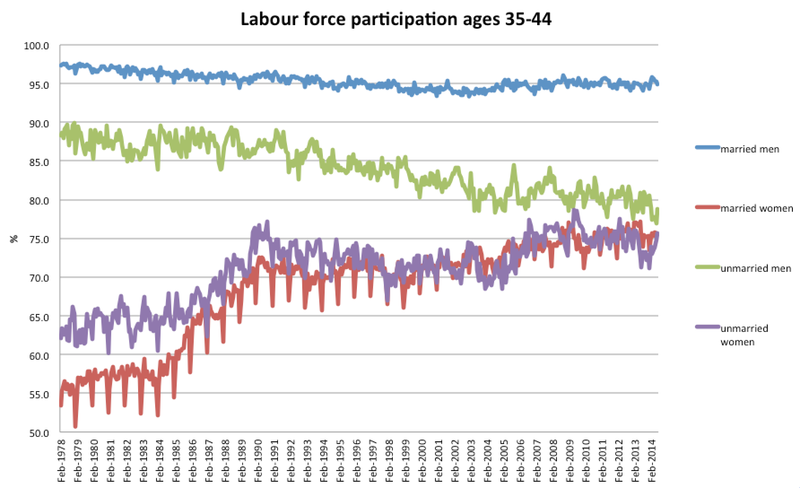 Can that explain the fall in unmarried men’s attachment to the labour force? I’m not sure it does, and this makes me wonder if perhaps the “discouraged worker effect” might be true. All those unmarried men might once have worked in factories. Maybe they’re less able or inclined to take service sector jobs. Posted on August 15, 2014 Author thomasthethinkengineCategories UncategorizedTags Australia, demographics, Economics, marriage, unemployment5 Comments on To have and to hold (a job). 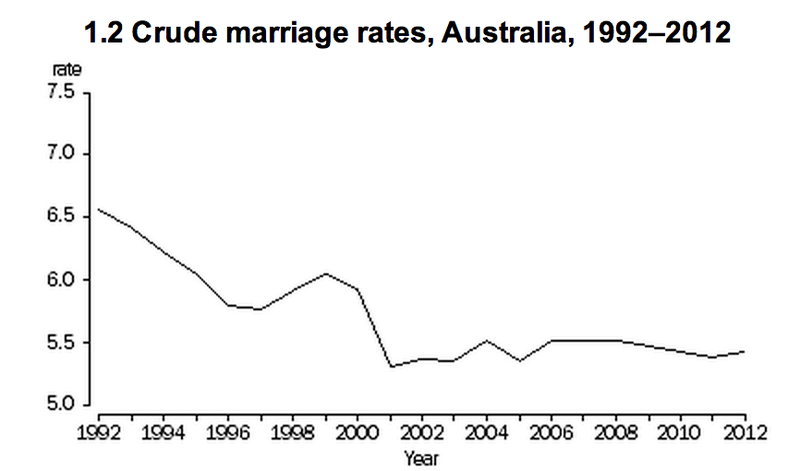 The correlation of marriage and employment is puzzlingly strong. Would a Public Transport Party do well in Victoria? The Victorian state election is coming up, and new small parties are registering. Given the rush of minor parties and independents that carried the day in the last federal election, it’s no surprise that Victoria is seeing a lot more parties registered with the Electoral Commission. Here are four that have recently applied. I am surprised when I look at this list, that there is no Public Transport Party. The issue of public transport is hot in Victoria right now, partly due to the increasing concentration of jobs in the CBD, and the resultant increase in crowding. Crowding above the acceptable threshold affects nine per cent of passengers in the morning peak, according to the latest data. It’s lower on some lines and up to 26 per cent on the Craigieburn and Werribee lines. In 2002 such a party existed. Called Public Transport First, it was founded by the late Paul Mees and fielded a candidate called Tony Morton in the seat of Brunswick. He lost but is now the head of the Public Transport Users Association. But perhaps 2002 was too soon for a public transport party. Stories about public transport are hot property in the press and on social media. You’d imagine a Public Transport party would get a decent share of the votes. It may be a less emotive topic than Voluntary Euthanasia, but it affects more people. And it’s a lot more sensible than a party opposed to smart meters. The Victorian Upper House might be the best chance to get someone elected. But its not a fait accompli. In the last election the Greens got 12 per cent of the first-preference vote and installed three candidates. Family First got 2.86 per cent of first preferences and installed none. It would be very tough to make an impact in the regions. 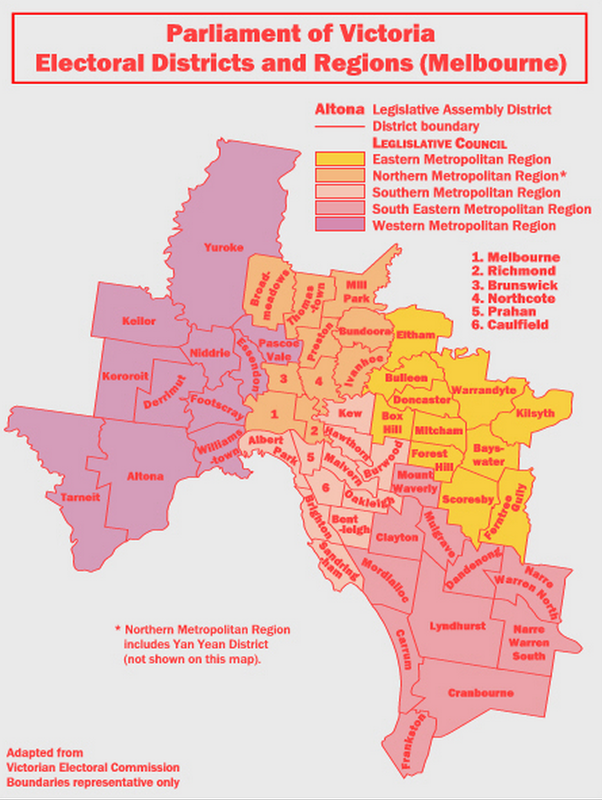 But there are five metropolitan “seats” in the upper house that each elect five candidates. Three of those elected Greens last time (western, northern, southern). These would have to be possibilities. But the advantage of a single issue party like this is not necessarily in getting elected. Simply by forming, the threat of drawing votes away from all the other parties can encourage them to shift their policy positions. It’s the famous Hotelling Effect, perhaps my most-loved of all the economic theories. Nevertheless, the challenges to starting a political party are many. You need 500 members to commit, you need the fees, and you have to pay $350 for each candidate you stand (refundable if you get 4 per cent of the vote. I imagine that actually becoming a politician would invite even more vitriol than just talking about it. When you look at it like that, I’m surprised there are so many brave people willing to start their own parties. Kudos to them. Posted on August 14, 2014 Author thomasthethinkengineCategories Uncategorized1 Comment on Would a Public Transport Party do well in Victoria? I went to an expensive private school. What was the benefit? 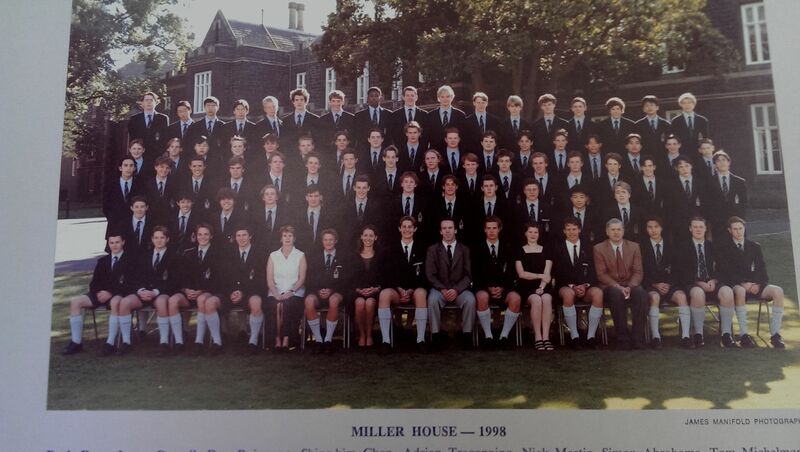 I spent six years of my life attending an independent private school – Melbourne Grammar School. It was expensive. I remember fees being around $10,000 a year. There is an article in The Conversation today about private schooling, entitled Private schooling has little long term payoff. The study also finds that graduates of independent schools are not likely to have higher earnings, nor more “prestigious” employment, after controlling for education. In a comment thread on the topic, a user called Gabrielle calls out the methodological elephant in the room. If a private school helps you get into university (independent school students had an 80 per cent higher chance of graduating from a G8 university, according to the research), and university helps you get a job, then controlling for university when trying to measure the effect of private school is distracting. Silly even. It takes just a glance at year 12 results to see that private schools dominate the top scores. I think we can conclude that going to a private school has a real payoff. But what form does it take? Dug this out. I’m second row, fourth from the left. I’m still close friends with some people I went to school with. But I have other friends who went to other schools, public and private. As far as networking goes, I’m not aware of any benefit I’ve got from “the old school tie” and quite acutely aware of the benefits that have come from people I’ve met in my professional life. Could seeing my school on my CV have helped me in job applications? It’s not impossible. I’ve never worked at Goldman Sachs or a law firm, so maybe it’s different there, but I’ve rarely been aware of the schools my colleagues have gone to. When I have known, they’ve mostly been graduates of government schools. I don’t think my employers have been deeply biased to private schools. So what was the benefit of my private school education? You can never know the counter-factual but I think I fit the data perfectly – I suspect got a better year 12 result at the school I went to than at another school chosen at random. Did the teachers “spoon-feed” me? I don’t know. They taught me, definitely. They were (mostly) highly qualified, diligent and happy to answer questions. I also worked my arse off in year 12, despite having been rather disinterested in years 9, 10 and 11. By working hard I think I maximised my potential. I got into a good uni course that eventually helped me get a good job. I wanted to beat the other kids by having a better score, and I knew they wanted to beat me. Even then, I was aware that the level of competition was peculiar. Would that competitive aspect have been there at another school? It could have been. It might have been stronger at a selective entry school. But the skew of high scores at my school suggests it was acutely competitive. I’m trying to refute the crazy notion that private schooling is not advantageous, and answer the question of where and how that advantage accrues. I know the world is unfairly skewed toward people who have the privileges I have. I’d like to see the opportunities of really motivating and rewarding educational environments shared really widely. Denying that private schools have benefits seems unhelpful in pursuing that goal. Posted on August 13, 2014 April 9, 2015 Author thomasthethinkengineCategories UncategorizedTags education, education policy, private school, university entry10 Comments on I went to an expensive private school. What was the benefit? Does Fairtrade work? And is it worth it? Brand new research. The evidence is in a new paper from the National Bureau of Economic Research: Fairtrade producers get paid more per kilogram of coffee, have higher incomes, use fewer pesticides and avoid child labour. The minimum price and the rules the organisation sets actually work. But there is an interesting question. Does Fairtrade just select for the marketing savvy farmers who would have been smart enough to get those benefits or other ones anyway? Complying with all those rules suggests nous.But Fairtrade seeks out small producers, who you would expect to be less savvy. The evidence supports the idea that Fairtrade certifies farmers who’d be ill-placed without it. Another way to test this is to examine a panel of producers over time. A side effect of the selection of less-educated and less-skilled farmers into these schemes, is they may have no idea what is going on. But it turns out the customers may not be that insightful either. The fairtrade label helps us feel better. And the amazing thing? It works even better if it costs more. That suggests that really, humans are quite kind-hearted. But such an attribute won’t exist for long before someone takes advantage of it. And so lots of “I can’t believe it’s not Fairtrade” schemes are on the shelves. The one I can find on lots of Aldi and Nestle products in my house is called UTZ. I’m not saying UTZ is bad. Just that companies will likely choose certifiers with the lowest cost to consumer impact ratio. When one proliferates, it’s worth asking the question of whether it is the real deal. 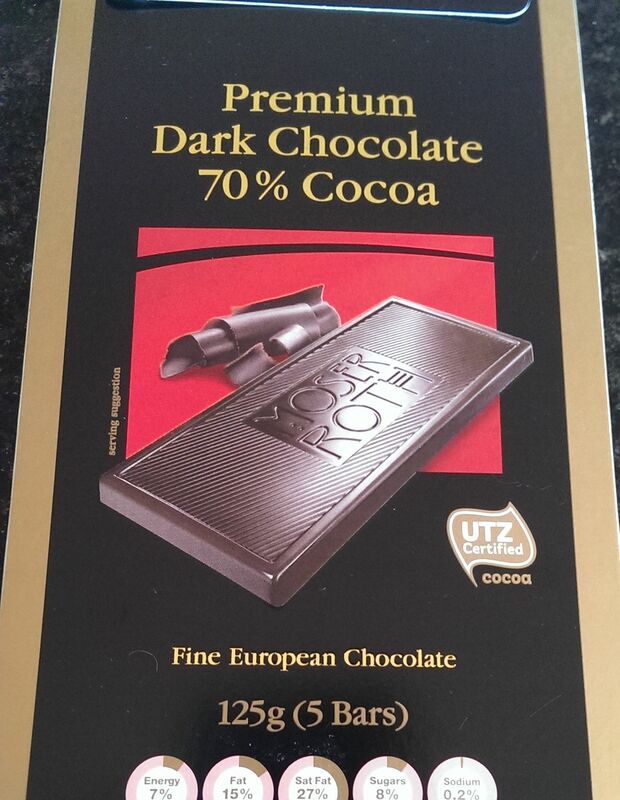 Posted on August 11, 2014 Author thomasthethinkengineCategories Uncategorized1 Comment on Does Fairtrade work? And is it worth it? Brand new research.